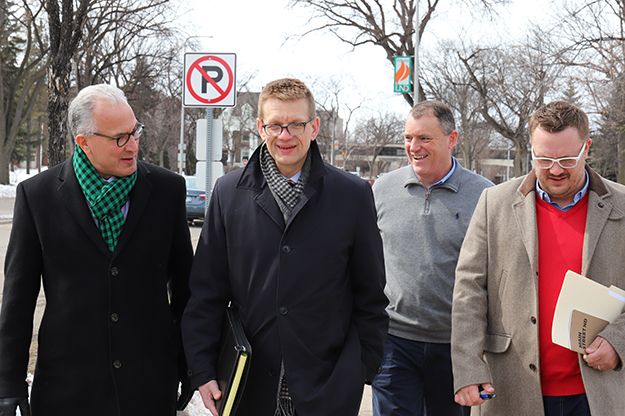 UND planners are collaborating with the City of Grand Forks and community organizations to revitalize the vibrant connection between campus and downtown, with University Avenue as the catalyst. From left to right: UND President Mark Kennedy, Grand Forks City Administrator Todd Feland, UND Associate Vice President for Facilities Mike Pieper, and Evolve Grand Forks’ Jonathan Holth. Photo by Connor Murphy/UND Today. The University of North Dakota is forging a new path with a Strategic Plan for its future. But the institution has much to learn from its own history. When Chandler Hall is razed later this year, the demolition team will salvage a piece of the building containing a bracket pulley from an early 20th century streetcar, one that traveled the two miles back and forth between the University campus and downtown Grand Forks. The pulley is a reminder of the important link between the educational and economic pillars of the community – a connection city leaders and University planners and students are now reigniting, with the cooperative re-imagination of University Avenue as a vibrant, unifying Main Street. 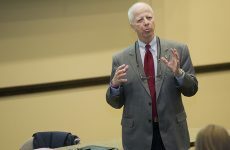 “This is our chance to get back to the connection that we once had,” said Mike Pieper, UND associate vice president for facilities. With a shared 2017 Vibrancy District Plan as a base, the two entities crafted a blueprint to leverage already existing infrastructure as a foundation for a more welcoming corridor, using joint planning and funding to increase walkability and public transit between the districts; explore public-private partnerships for concentrated mixed-use development; create new opportunities for housing and Greek living; and challenge area students to engage in the process. If successful, UND and the City will unite their respective “downtowns,’” bringing economic vitality into the community and making Grand Forks a destination for students, young professionals, and families. This rendering shows what could be possible through a vibrancy partnership between the City of Grand Forks and UND. 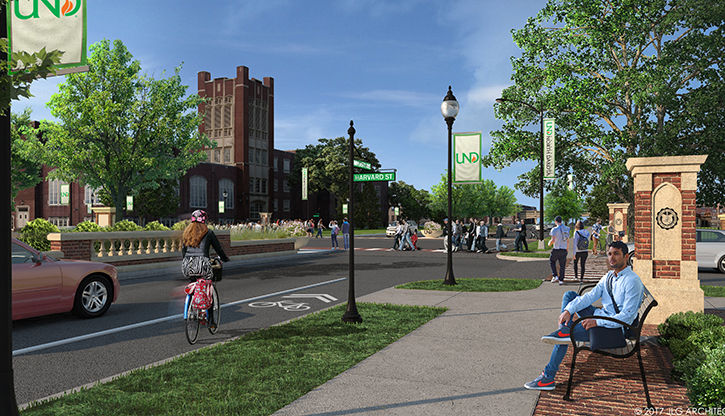 The entities plan to merge two projects – the 2020 repaving of University Avenue and the University’s Coulee to Columbia campus beautification initiative. A revamped road would include safer medians and lighting, potential bike lanes, benches, landscaping and more. Image courtesy of JLG Architects. The University and the City of Grand Forks are harnessing a whirlwind of opportunities. The North Dakota Department of Transportation (NDDOT) and City’s plan to rehab University Avenue in 2020 (from downtown to State Street on campus) fell in step with UND’s Coulee to Columbia initiative to enhance the appearance and functionality of campus along University Avenue. The timing was right for teamwork. The City and UND have submitted a joint grant to the NDDOT under Governor Doug Burgum’s Main Street Initiative to receive funding for safety and amenity work that is best completed before the 2020 repave of University Avenue – smarter medians, enhanced bus stops, benches, decorative lighting and more. Pieper added that that those updates will foster another potential piece of UND’s 30-year master plan – bringing in private partners to develop mixed-use retail/restaurant/apartment spaces in currently vacant pockets along University Avenue, including the area across the street from the Law School and Memorial Union. City planners will work with UND to rezone these prime areas, and other areas along University Avenue’s connecting corridors, through micro PUDs – or planned unit developments. The University will also seek state incentive designations for some properties, offering potential developers tax incentives to build. Tied into that discussion will be future opportunities to better concentrate the Greek community with available construction space on University Avenue east of Columbia Road, as well as areas for additional housing choices, ultimately drawing students, staff and others closer to all of campus’s newly established conveniences. 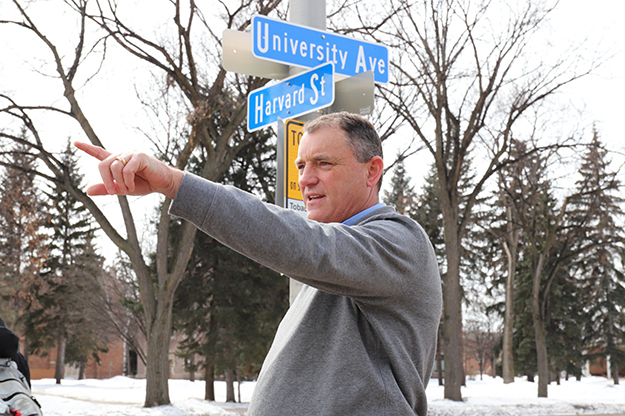 Mike Pieper, UND associate vice president for facilities, points out where new opportunities may arise for mixed-use development along University Avenue during an April 2 walking tour of campus. The University will work with the City to bring in new amenities, attracting more people to study, live and work on or near campus. Photo by Connor Murphy/UND Today. One may imagine a lot of “guys in ties” driving this vibrancy initiative, but the ideas of the UND student body have been a cornerstone of planning and execution. Student Body President Cole Bachmeier has consistently met with President Kennedy, the Grand Forks Mayor’s Office and development leaders to ensure the student voice is heard. Bachmeier is also in talks to bring a bike share program to campus. If approved by student government, it would be another chance to utilize a streamlined route to downtown. “We want to remove the boundaries that we currently have and make Grand Forks a more cohesive town,” he said. The student role in city development is being further fortified by the team at Evolve Grand Forks, who are partnering with UND, the Alumni Association & Foundation and more to create a contest for UND and Grand Forks high school students. The #MainStreetGF Challenge asks students for community-enhancing proposals based on the three pillars of Governor Burgum’s Main Street Initiative – healthy, vibrant communities; smart, efficient infrastructure; and a 21st century workforce. 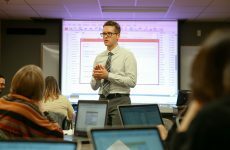 “We hope that this will keep students engaged in the issues that matter in Grand Forks,” said EvolveGF’s Jonathan Holth. 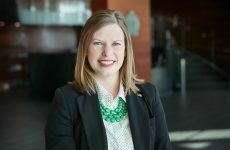 “EvolveGF and UND recognize that it’s important that our youth have a strong say in how their community develops, and this programs addresses that head on. Unlike a century ago, when it took a clanging streetcar to connect town-and-gown partners, these relationships can now be built on the desire for an innovative, safe and welcoming community.